•The allocated user has not the required skills to complete the activity. •The case can be better managed by another person. •A higher level of authority is required to complete the activity. 1.Through the cases administration options. In this case the user chooses a new allocated user between all active Bizagi users. 2.Enabling activities to be reassigned by the allocated users (that are not Bizagi or process administrators). In this case the user chooses a new allocated user between all active Bizagi users. 3.Enabling activities to be released by the allocated users (that are not Bizagi or process administrators). In this case the task is automatically reassigned according to the defined allocation rules. 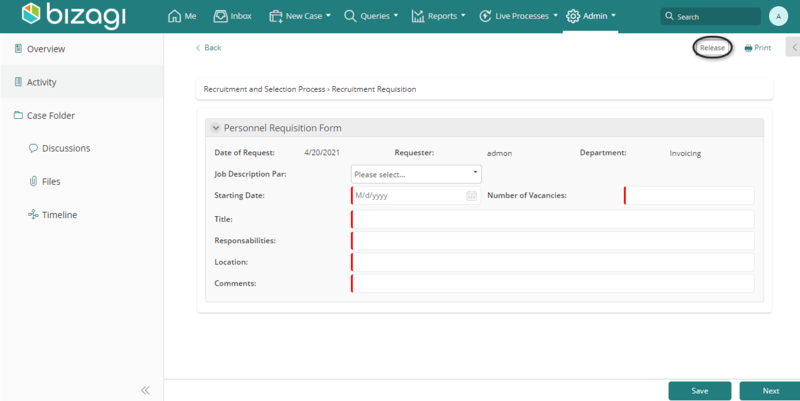 This option is enabled in the Work Portal only for Bizagi or process administrators, under the Admin options. 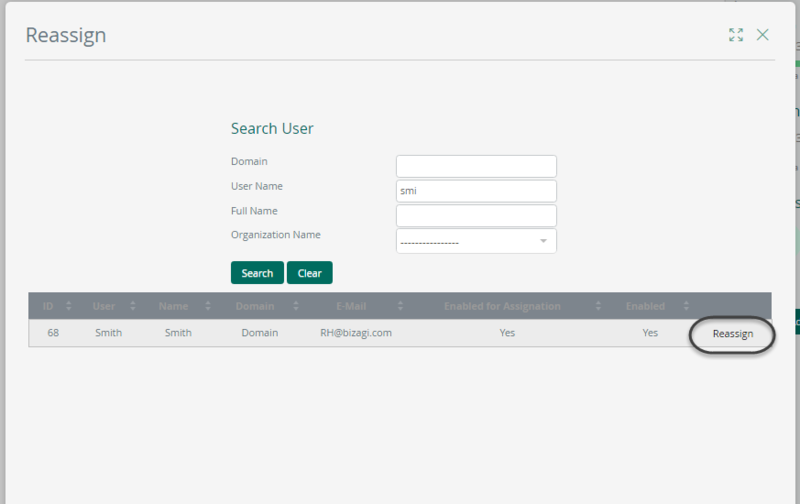 From here administrators can select the activity to be reassigned and the user to be allocated from the list of active users. For further information please refer to cases administration. This option lets the allocated user of an activity or event to reassign this task by selecting a user from the list of active users. Activities or events that can be reassigned will display this button ( ) at the upper right corner. 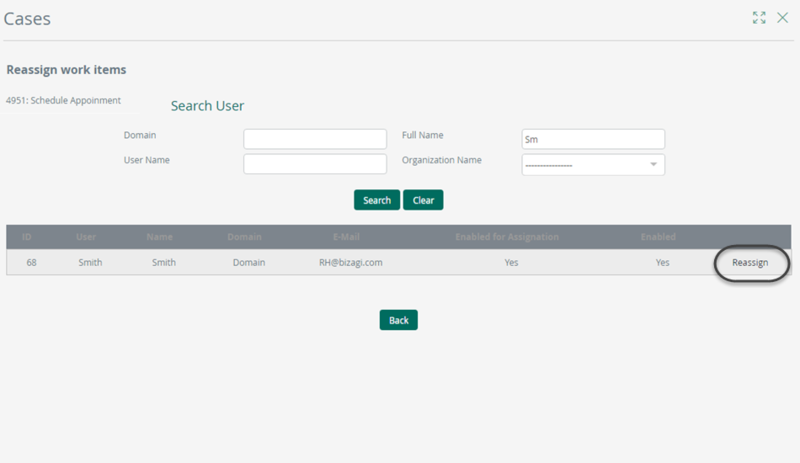 Once clicked, a new window will appear in which you can search and select the user to be allocated. A message will confirm that the activity has been reassigned. 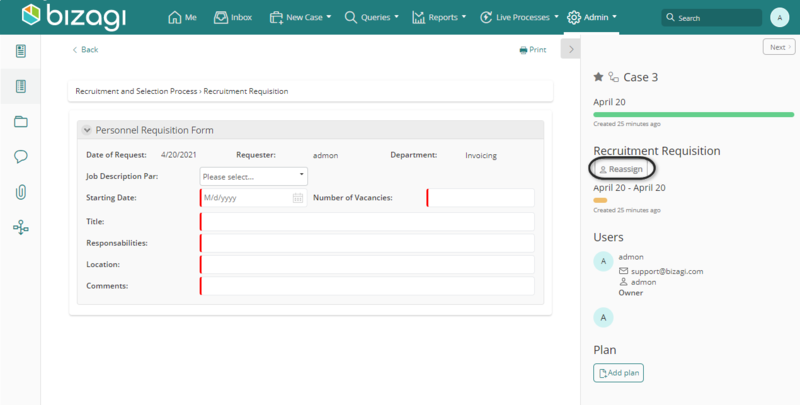 To enable a task or event to be reassigned, all you have to do is go to the Process diagram (first step of the Process Wizard) and select the Can reassign checkbox that you can find at the element's Properties in the Runtime tab. •The defined allocation rules will run to allocate the activity again. The user releasing the activity will not be taken into account in the new allocation. •If no user meets the allocation rules, this activity is allocated to the default user, no matter if this user is the same one that released the activity. Activities or intermediate events enabled to be released will display this button ( ) at the upper right corner. The activity or intermediate event will be reassigned. To enable a task or intermediate event to be released all you have to do is going to the Process diagram (first step of the Process Wizard) and select the Can release checkbox that you can find at the element's Properties in the Runtime tab.